As per assessment, majority of the projects are known to be delayed, or having cost overruns or have failed. Hence, Project Management, as an independent discipline, has been gaining increasing recognition as a critical differentiator for better business performance. Specialized knowledge and skills are needed for effective project management. To assist organizations in making the right investment in their PM staff, QAI Global Institute has developed a role-based competency framework for project management professionals, namely UCFPm-The Universal Competency Framework for Project Management. 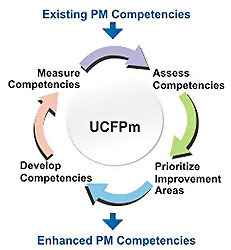 UCFPm is developed to support organizations by providing a reference framework to objectively evaluate the competencies of project management professionals. Aligned to all the major project management bodies of knowledge like PMBoK®, PRINCE2®, CMMI® and with more than 3000 questions UCFPm can support organizations of all sizes in establishing a standard competency dictionary. Project Management is a vast area wherein projects of diverse nature, size and complexities are performed. The PM skills and capabilities needed for each project could be different and it becomes a major challenge to assess the competencies of the staff to select the right project managers and/or to identify the skill gaps for defining a learning path. The traditional ways of assessing the competencies have been many and have their own limitations and may not give a true assessment of the capabilities. This generates the need for an effective skill assessment mechanism that can be used to fulfill these requirements. Any associated industry professional groups involved in Project Management. QAI’s PM Competency Assessment Service is designed with an objective to assist organizations in making the right decisions on their Project Management workforce. It is based on the widely accepted global standards and best practices and helps organizations by providing an objective role-based competency assessment.